Has your car’s engine seen better days? Do you have a customers vehicle that needs a complete engine overhaul? If you are shopping for a new engine for a vehicle, the most cost-effective option is to shop for used engines for sale. In Chicagoland, Auto Parts City is the number one resource for quality used engines at affordable prices. Auto Parts City has used engines for just about any make or model of vehicle, including the harder to find collectors or vintage cars and trucks. This means you can make one stop and find exactly what you need, and our clean, organized recycling facilitys make it simple to locate an engine that will match your requirements. In addition, we have a highly trained team of engine experts that use our searchable database to locate an engine that will be compatible with your car. The next time you need a used engine, don’t waste your time calling recycling facility after recycling facility. Start with Auto Parts City, and find the largest selection of used engines for sale all in one place. With our help, your search for an engine is over! Why should you consider shopping for used engines from Auto Parts City instead of replacing your engine with a new one? First, a used engine is just as reliable and will deliver just as good of a performance as a new engine. At Auto Parts City, we are very selective about the engines we place up for sale, and these are tried and tested. You will be purchasing a dependable engine to get your car up and running. Second, and perhaps most obvious, when you purchase a used engine from Auto Parts City, you will spend less money. A complete engine overhaul is one of the more costly repairs you can do, but a previously used engine will cost significantly less than a new one. For cars that have been totaled or vintage cars that you are restoring, where the entire engine needs to be replaced, this is the most cost-effective option. Finally, buying a used car engine helps you reduce waste. Not only do you prevent your car from becoming the next addition to the scrap heap, but you also help the engine to get a new life in your car. When you shop with Auto Parts City specifically, you are shopping with the Chicago area’s most eco-friendly recycling facility. This means your money is going to support waste-reducing procedures like our signature recycling for automotive fluids and more. The environment is a responsibility everyone should take seriously, and with Auto Parts City you can shop for used car engines and do your part to keep the environment protected for the next generation. We have engines for sale at Auto Parts City South for cars and Auto Parts City North for trucks and other large vehicles. Give us a call to see what we currently have in stock, or stop into one of our clean and organized recycling facilities to search for yourself. Our extensive, always-changing inventory means you have an excellent chance of finding exactly what you need when you shop with us, and our friendly, knowledgeable staff will make it simple to locate the right engine for your needs. One of the benefits of shopping for used engines for sale with Auto Parts City is our extensive variety. We are the Chicago area’s most trusted recycling facility and salvage yard, and as a result, we get a number of vehicles in that other facilities never see. In addition to passenger cars, trucks, SUVs and vans, we also see work vehicles, utility vehicles, collectibles and rare options. This variety means we likely have exactly what you need in stock, or can help you locate a compatible option easily. 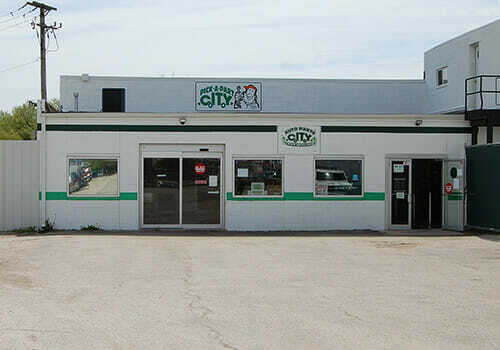 If you have a hard-to-find vehicle, Auto Parts City is ready to assist. Contact our friendly team today, and learn about your options as you overhaul that vehicle. With used engines from our recycling facility, you can quickly get that car or truck back up and running again, with a reliable and efficient engine under the hood. When you visit Auto Parts City in search of a used engine, you will be instantly impressed. Why? Because we have been named the “Greenest Junkyard in the Country,” Our team works hard to bring better recycling methods to the auto recycling facility industry, and you can be confident shopping with us as a result. We are also one of the cleanest scrapyards in the area, because we want our facility to be an asset to our local community. Our goal is to serve our local community in the most environmentally responsible way possible. This starts with our commitment to being conscientious stewards of our local environment. At our recycling facilities, we have a recycling system that is built underneath the facility designed to filter and recycle all of the car fluids from the vehicles we receive. Most of the fluids are filtered and either resold or used right here in our facility. Then, once the fluids are drained, we recycle the engine, parts, tires, metal and glass, so as little as possible hits the landfills. Our inventory in the yard is constantly rotated, minimizing rust and other problems. Finally, our stormwater filtration system keeps any remaining pollutants out of the local environment, so the water coming out of our facilities is clean and safe. You can trust Auto Parts City to deliver quality used engines at affordable prices, all while doing our part to protect the local natural environment. Stop in today and see what eco-friendly automotive recycling looks like, then leave with the engine you need to complete your project. We proudly serve Chicago, Gurnee, Waukegan and the surrounding Northern Illinois and Southern Wisconsin communities, so make plans to visit today. If you need a new engine for your vehicle, we have the used engines for sale at the cleanest and most environmentally conscious recycling facility around, so make Auto Parts City your first choice.